TOWER GROVE — Evidence of my problem is all over the office, and the movers unwillingness to schlep it up there should have been the first clue. When we moved into the house more than 10 years ago, the fine folks helping us transport our furniture and clothes and doodads from the apartment stopped at the bottom step when it came to carrying 42 boxes of books up to the tree house, the name for the office on the third floor. I carried them up myself in as close to 21 trips as their weight would allow. Labor didn’t teach me the lesson. I kept buying books. I buy them as souvenirs from bookstores around the world, from the bookstore near Charing Cross or in Pirate’s Alley in that little re-purposed military shelter in Malta. I buy them on Amazon.com because it’s a good deal or it will arrive the day it goes on sale (a miracle of modern post!). I buy them downtown when I’ve read a good review in The New York Times or elsewhere. Some shelves are double-stuffed with books, and pillars of my problem have grown in front of those bookshelves, some stacked 32 paperbacks high. I’ve bought and been given so many books that movers would again leave the moving to me — and 21 trips won’t make a dent this time. My name is Derrick. I’m a bibliophiliac. So, I’ve made a New Year’s resolution. No more books. No more impulse buys. No more killing time in the stacks at a bookstore only to leave with the latest hardbound. No more … Well, there have to be some exceptions. Tom Wolfe’s new book (if it actually comes out) and Mark Leyner’s The Sugar Frosted Nutsack get the favorite author and great title exemptions. Books for need work can’t be ignored. Books by a few authors have to sneak through the resolution. Books pre-ordered before Jan. 1, 2012 despite the fact they won’t be released for another several months … OK, OK. I know. I know. Yes, I’m guilty of a preemptive strike or two against the resolution. Pillars of books in front of the shelves of more books. Snapped on Jan. 2, 2012. The Know-It-All … pg. 61, or “K”, with a Joker card as bookmark. Sucker’s Progress … multiple bookmarks. That last book is by Herbert Asbury, the author of Gangs of New York, and while it appears to be about the rise of gambling in America it serves as a fitting example of my issue. I can’t even tell how much progress I made in the book because who knows how long ago I left any of the bookmarks in there. Sucker. Writing that list should at least shame me into a good month of staying true to this resolution. The goal of this resolution is to finish these forgotten books and move steadily through the sediment of novels and biographies that has collected in my office. Why visit the bookstore when I’ve already moved it up two flights of stairs. So, I resolve not to buy any more books — with some exceptions (see the fine print) — until I’ve made a dent into the books I have. Now, if you’ll excuse me I have some reading to do. And, Amazon.com is taunting me from another tab. Stay strong. Stay strong. This entry was posted in books, journal, project 365+ and tagged books, journal, new year's resolution, pirate's alley by dgoold. Bookmark the permalink. I’ll take any of those Essential Marvel or Showcase Presents DC off your hands. And that Madden biography is one I’ve been thinking about. Oh, and if you happen to have an McClellan compilations or that crime book he did. And if you ever finish Game of Thrones … Give the books away is almost like reading them. The would go to a good home. I see Superfreakonomics in the picture. Not sure if it was that book, or its predecessor Freakonomics, but one of them said children who grow up around books are more successful. Nobody knows why, and whether they actually read them, or see them being read, doesn’t seem to make much difference. Maybe that’ll make you feel less guilty about the large pile. As for not making it larger, well, that’s noble too. That’s the one lesson that has stayed with me from the original Freakonomics. The kid’s room is also a wilderness of books for that reason. Shelves here. Stacks there. Heck, I’ve encouraged him to take a book or two to bed and if he falls asleep with them there then so be it. I don’t think it’s just enough to surround him with books — but it does make him curious about them. 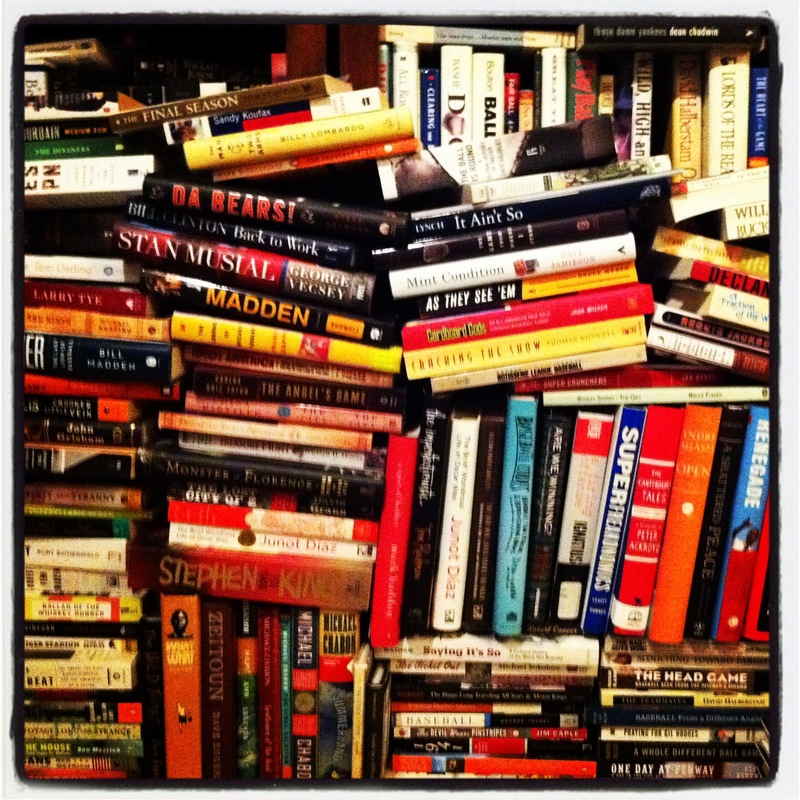 I set up a “for every in, an out” and a “read all in this year” rule on books in 2011 and it did work well for me for the most part, although I have about 20 in I haven’t managed to get to yet. My downfall was library books, which at least go in and out within 9 weeks at the most.